Chalice- The sacred chalice, a vessel that is known through all faiths as a most sacred object. It is related closely with the ideals of Women’s Mysteries. In that a woman’s womb is hidden the secret of the creation of life. Many legends have used a chalice as the scared or magical object to attain eternal life like: the Holy Grail and the Fountain of Youth. Also within a basic ritual the chalice is used to symbolize fertility and the giving of life. This is why we first poor out some of the wine, mead or water we have within our chalice, that mother Gaia may partake in the blessing that we may obtain more sustenance. A chalice makes the perfect gift, in fact it is one of the more appropriate magical items to give to another, it is like a personal blessing and well wish to the receiver. An ideal situation would be to give it to a young woman coming of age, a new mother, or perhaps when getting a new house to bless the land those within the home. You can use your chalice in magic to bring to yourself those things that will help you most to grow. That is what the feminine form of most magic does, it brings forth what is needed to heal and improve one’s life and family. And that is your chalice, the ideal feminine form upon your altar. And like everything else one can be found to fit you and your needs. 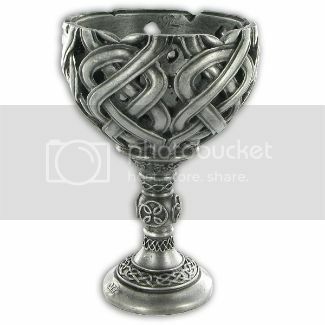 The most common form with which to find a chalice is silver, silver being a feminine metal and gold being the masculine. Carved into the side could be a pentagram, or perhaps some runes. I have even seen some that depict on the sides of the chalice the image of the maiden, mother and crone (another ultimate feminine symbol). However any vessel with a stem will do. Also you don’t have to just find one, have two or three. One can never have enough chalices, they are a fundamental part of your work. Regardless if you are male or female, we all came from one and have with in us that need of the presence of the female divine.